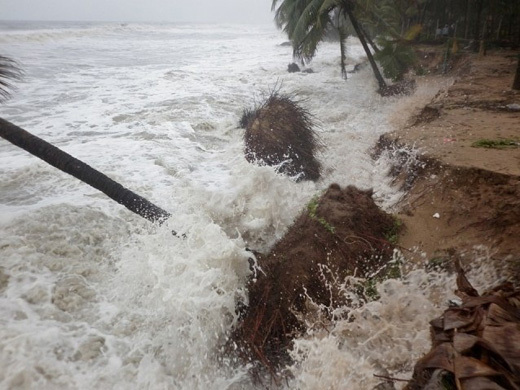 Udupi: July 9, 2015: With sea erosion intensifying in Padukere village, about 15 km from Udupi, the residents are scared as the lone road running through the village is facing the brunt of the rough sea waves. Padukere is a peninsular village facing the Arabian Sea to the West and the Udyavara rivulet to the East. People, mostly fishermen, have been living here for generations. The lone concrete road is their link to towns such as Katapady, Kaup and Udupi. But monsoon has once again demonstrated the fragility of the temporary sea wall erected by putting up boulders. Though the boulders have been placed next to the concrete road, there is now a real danger of it being engulfed by waves near the Pandarinatha Bhajana Mandira at Kankod. Vidyaraj, a resident, said that the Department of Ports put boulders every year to check sea erosion. “But it has been of little use as the boulders get washed into the sea. It would be better if the government builds a breakwater for every 200-metre stretch along the coastline,” he said. What has generated fear among the residents is that sea water sometimes crosses the road during high tides and joining the rivulet at Kankod, where the distance between the sea and rivulet is about 100 metres. “During high tides, sometimes, the sea water rushes and joins the rivulet. People travelling on the two wheelers get drenched. I live in fear during the day as all people go out to work,” said Girija Poojary, a homemaker, whose house is located next to the Bhajana Mandira. “We want a 300 metre-long sea wall near the Bhajana Mandira as sea erosion has been occurring in this place for the last three years. We have brought this matter to the notice of officials and elected representatives, but they are doing nothing,” said Shivaram Puthran, a fisherman. Why our government not taking any steps for the control soil erosion?